Through the USB 3.0 Super-Speed transmission interface, the GR2660-B3 accommodates two 2.5" hard drives or solid state drives. 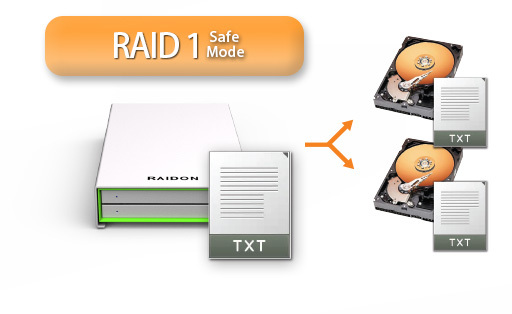 With the built-in RAID mode switch, you can easily switch between RAID 1 (mirroring), RAID 0 (striping) or JBOD configurations, giving you both security and fast transmission. GR2660-B3 requires no fuss and no tools.Everything is that simple by installing the drive, choose RAID mode, format the disk, and you're ready to go! Inside the GR2660-B3, you'll find a SATA III (6 Gbps) chipset and transform to a USB 3.0 (5G) interface which is the most convenient interface. That means you'll get transmission speeds over 60% faster than the previous generation R2420. 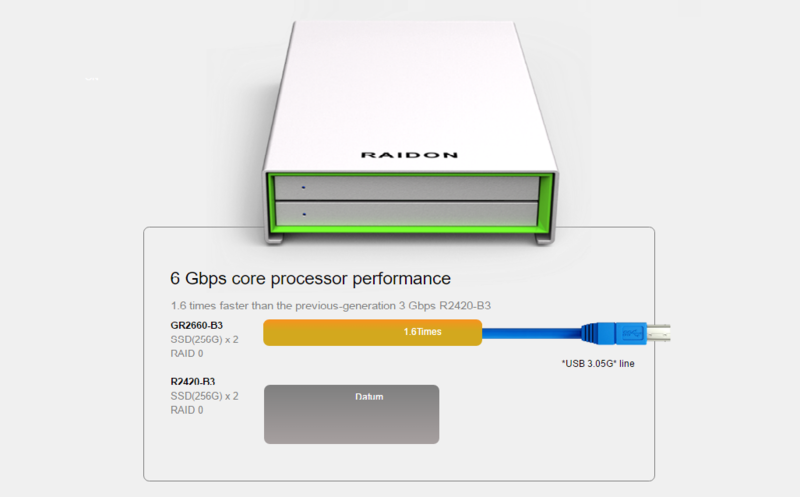 GR2660-B3 GR2660-B3 has three configuration modes built-in: RAID 1 (Safe Mode), RAID 0 (Speed Mode), and JBOD (Two Independent Volumes) for you to choose according to your needs. 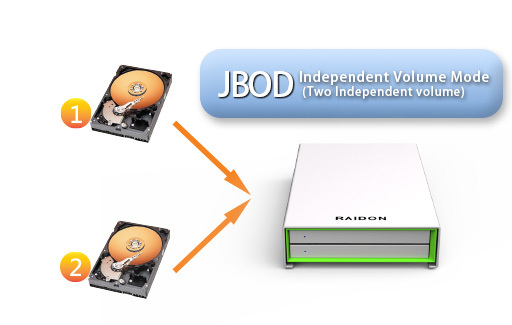 In this mode, you can install two disks that have different volumes and use them independently.There is no RAID configuration and without special safety or speed differences. You can also use this mode in apply with other RAIDON modules. RAID 1 refers to mirroring. All data that is saved on the main disk is also written identically to the mirror disk. When the main disk is damaged, the mirror disk takes over the main disk. This makes RAID 1 the safest of the modes. The two disks are merged into one disk, providing no data security. When saving data, the data is divided into a number of segments corresponding to the number of disks. 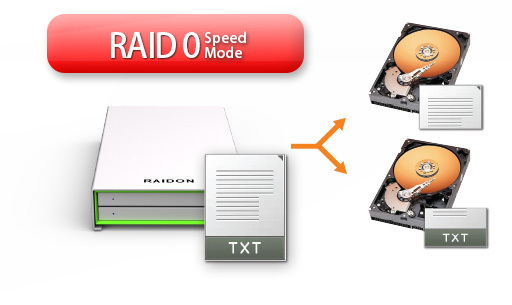 The segments are written to the disks simultaneously, making RAID 0 the fastest of the modes. GR2660-B3 casing of the GR2660-B3 is made of highly recyclable aluminum. 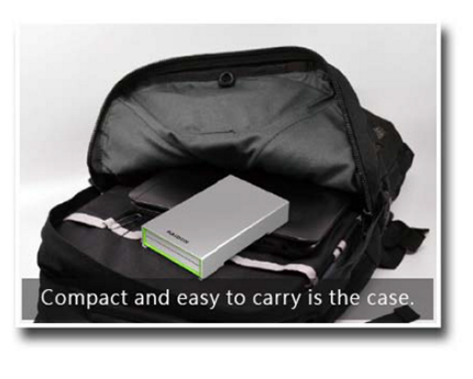 The casing completely encloses the disks inside, protecting the high-capacity disks and data when it is on the move or in a backpack. 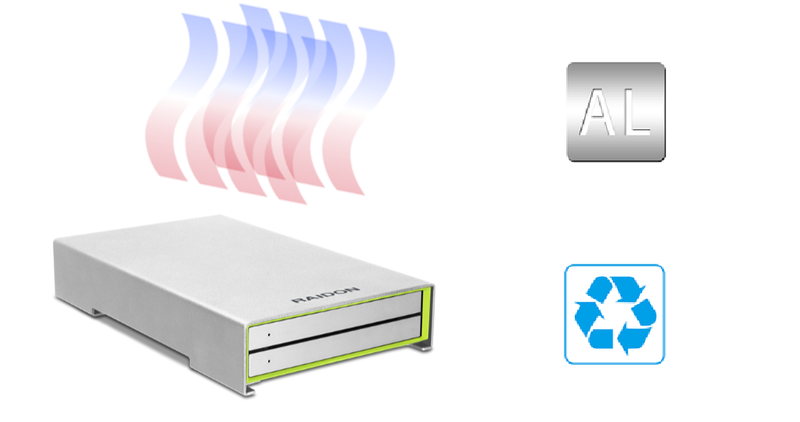 Not only is the casing made of sturdily-built aluminum alloys, the excellent heat dissipation of aluminum also means that it is highly efficient in cooling and absorbing the heat of the internal components, keeping your hard drive safe and right temperature. 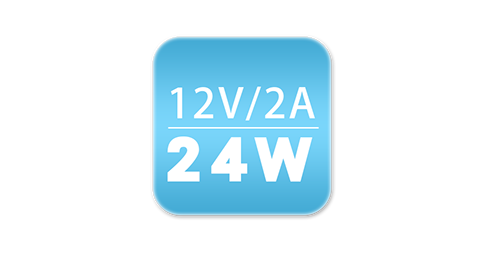 GR2660-B3 uses a 12V/2A (24W) external power supply,meaning that you'll never have to worry about running out of power even when you're using a 2TB/7200RPM hard disk. You only focus on your work; the specification issue RAIDON conceives for you. As a professional photographer, every assignment is an all-new challenge, to protect the huge amount of digital data, fast in build folder and well-managed is important for every professionals. To protect those precious digital data lead to GR2660-B3, under RAID 1 mode safely backs up all of your important data in two hard disks. The enormous capacity of the hard disks completely replaces to carry a pile of memory cards. The files imported to the GR2660-B3 can be managed through software like Adobe LightRoom or Aperture, allowing you to quickly organize your important photos or even helping you quickly find the photo you need. In case of your files are too big for internet transmission, but you need to use the same files in different occasions with different equipment, such as, the size of your image or video library may number to 4TB. Then, hard disk swap design is most suitable for your requirement. GR2660-B3 under JBOD mode, each disk is independently data bank, you can quickly swap to the image library by your choice. 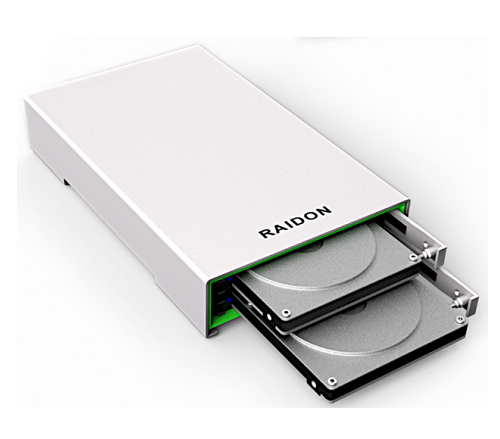 Also, use other RAIDON modules to fulfill your needs in different environments.